I perused some of the 14 other titles – “Parable of the Flycatcher,” “The Nuthatch,” “Hawks: A Homily,” “Parable of the Wren,” – then closed the book and left it on the kitchen counter near the coffee pot to wait for dawn. Next morning with coffee and book in hand I sat out on the deck where towhees were conferring with chickadees and cardinals conversed with wrens to read the rest of A Conference of Birds. 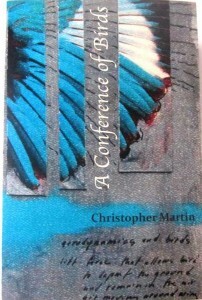 The book is Christopher Martin’s first book of poetry. Martin lives in the Georgia piedmont near Kennesaw Mountain with his wife and two children and is pursuing a Master of Arts in Professional Writing at Kennesaw State University. He is the editor of the online literary magazine Flycatcher: A Journal of Native Imagination and his work has appeared or is forthcoming in “Shambhala Sun,” “Loose Change Magazine,” “New Southerner,” “Buddhist Poetry Review,” and others. Martin is working on “Native Moments: An Ecology of Fatherhood,” a collection of essays and has contributed to the “Elevate/Art Above Underground” project in Atlanta. Crowe and others with open eyes; open ears and open hearts speak to us in clear voices – not only about the world around us but how the world around us and the world within us is only one world. I found Martin’s poetry tight and timely; what poetry is about – in the now, while brushing eternity. I know you can purchase A Conference of Birds here – http://www.spdbooks.org/Producte/9781883197261/a-conference-of-birds.aspx. Or for more information contact New Native Press at http://www.newnativepress.com/.